Renewed Sponsorships, and our Upcoming Fundraiser! Friends, I am happy to report that we’ve had a great week this week for sponsorship, with two returning sponsors renewing their annual commitment to RTC! Brian Dube dropped by on Monday with his sponsorship cheque, and when I went to the mailbox today, I was delighted to see a cheque there from Unifor Local 200. It’s such a good feeling to know that our sponsors have our backs and want us to succeed. Brian Dube has been sponsoring Riverfront for the past several years. Also President of the Board of Directors of Children First, Brian has a keen interest in young people, and their potential within Windsor and Essex County. We are deeply grateful for his commitment to Riverfront and the youth in our community. Generously sponsoring Riverfront for a third season is Windsor’s own Unifor Local 200. Representing the workers and retirees of Ford Motor Company, Nemak, Penske, and Voith in Windsor, RTC is proud and grateful to have the support of Unifor behind us every year. Coming up NEXT MONTH! Our annual Hallowe’en Bowlathon! 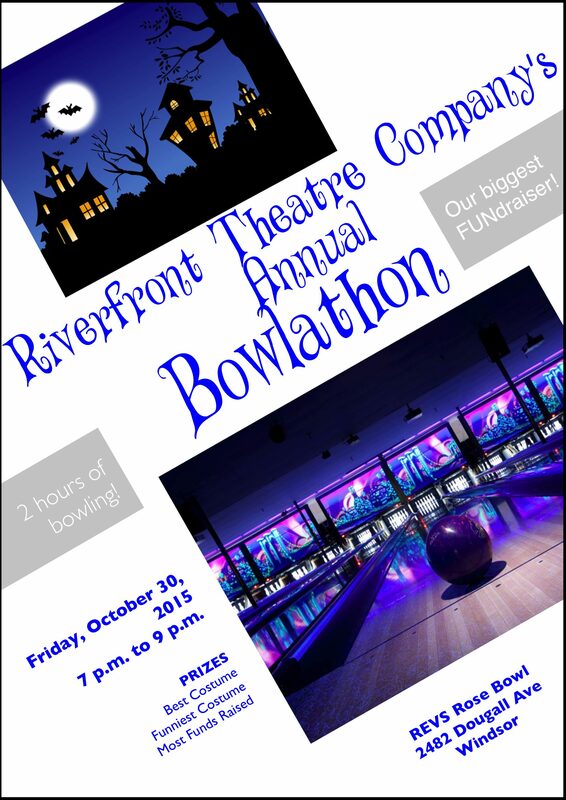 RTC’s annual Bowlathon is coming up at the end of October. This is our major fundraiser for the year, though we also enjoy our car washes, and will be holding an Applebee’s fundraiser in January. In early November, I believe we will also be turning out en masse to see The Peanuts Movie at Lakeshore Cinemas as a mini-fundraising event. But for us, the big one is the Halloween Bowlathon. Bowling itself is only open to our RTC families, but your chance to participate with donation funds is here! RTC students will be approaching their neighbours, their friends, their families, in coming weeks, with a goal to building our base for the season’s expenses. Our goal is to heighten awareness of our upcoming shows. We have a goal of $100 in fundraising for each student in the programme. Even small donations can help our students each reach that goal. Please – support your favourite RTC team member! If you’re out of town, and it’s tricky to get that money into their hands, you can always email your donation to RiverfrontTheatreCompany@gmail.com, and we’ll just do an e-deposit for you – but be SURE to provide us with the information for charitable tax receipts, if you want one (receipts issued for donations of $20 or more). Please note: If you’re ever facing a choice between attending a play, and supporting a fundraiser – we would rather have you buy tickets to the plays. If you’re unable to attend the plays, or you would like to support in both ways, we welcome your support in our fundraisers as well. Next: Next post: October 3rd Rehearsal News, and the Cast of A Salute to Peanuts!